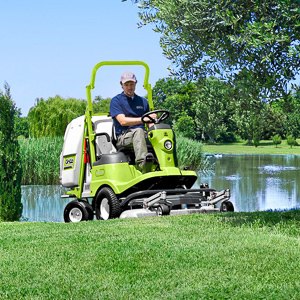 A professional hydrostatic mower with front-mounted cutter deck with a grass-catcher capacity of 450 Lt. 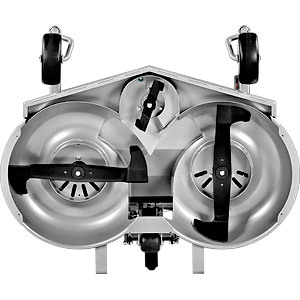 The grass-catcher discharge height is 170 cm with an ejection of 45 cm; the cutting and high performance collection of this model are its best features. 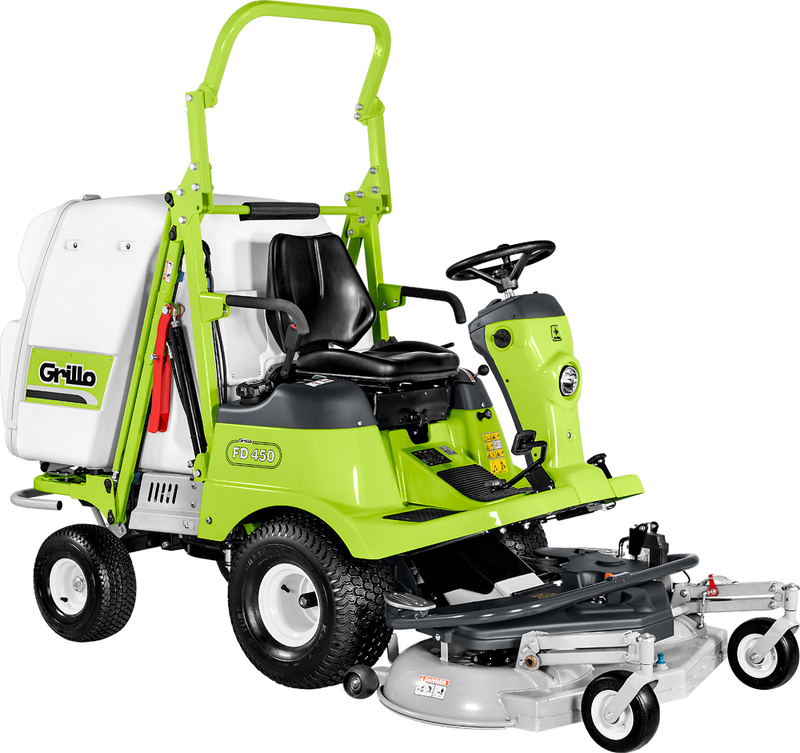 The easy light steering and exceptionally small turning circle make the Grillo FD450 a mower suitable for domestic use but at the same time equipped with all the necessary features for the professional operator. The controls to adjust the cutting height, lift the cutter deck, raise and tip the grass-catcher are via an electrical push button. 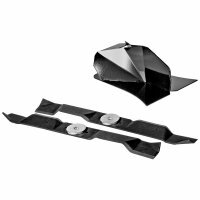 The FD450s cutter deck is unique. 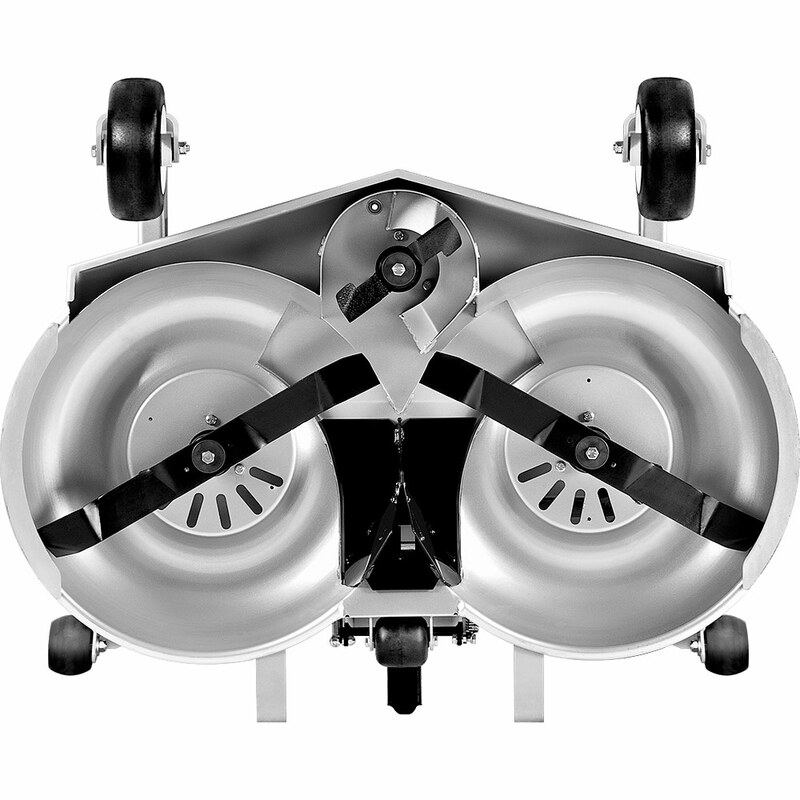 It has twin counter-rotating blades (which are not timed) plus a small front blade. 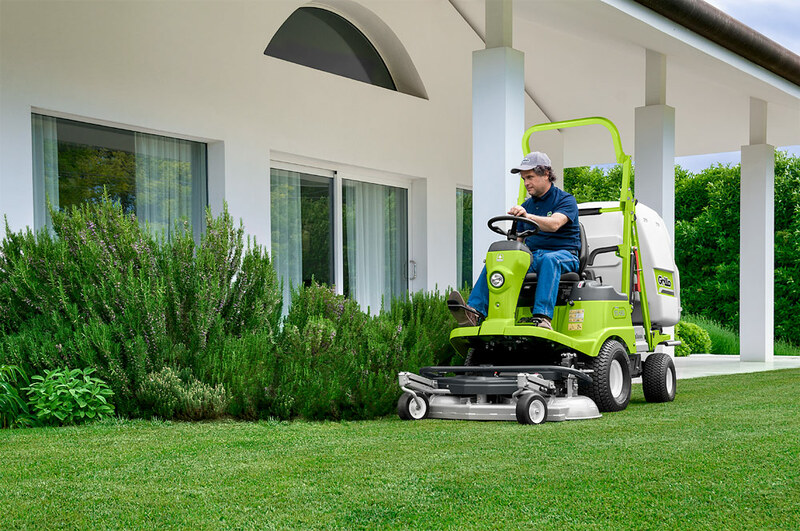 It is a real out-front mower deck: 50% of its surface is free from obstacles thus ensuring perfect visibility of the working area. 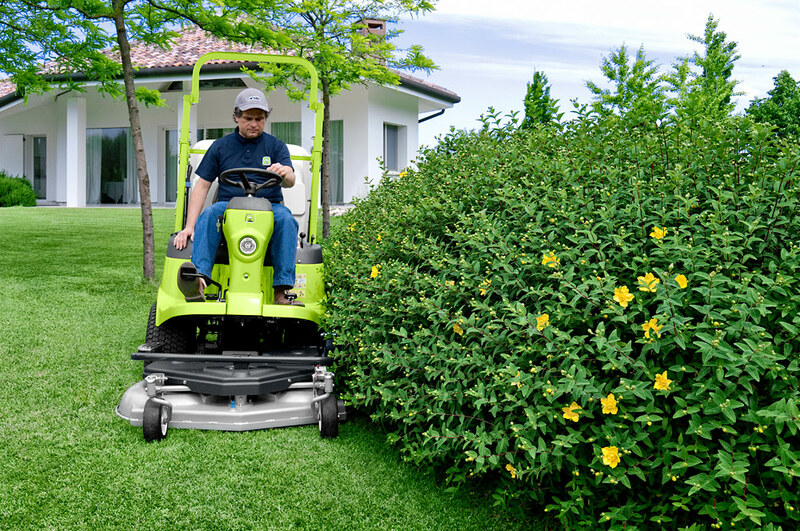 It allows precise cutting around bushes or under low-positioned branches and therefore reduces the time spent using hand mowers to finish off these areas. The deck also has additional front and side reinforcements. The blades drive belt is double backed ( not toothed): in the event of contact with unseen objects it should not suffer damage. 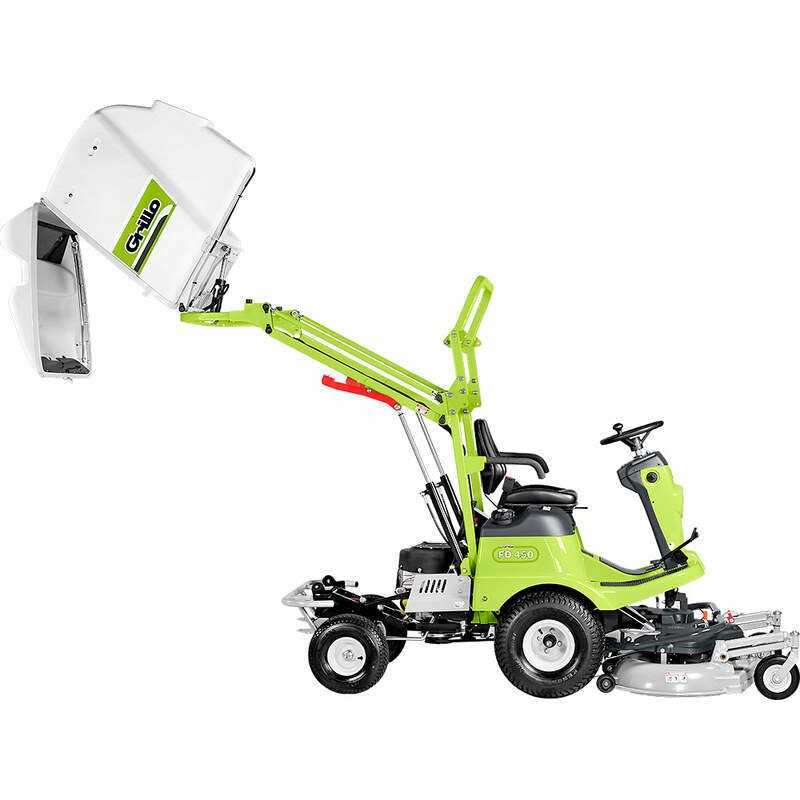 The innovative cutting system produces increased acceleration of the grass/air flow. All the blades direct the grass into a large, straight load chute at the same time significantly increasing the load capacity. In this way the grass is very well-compressed improving the overall efficiency of the 450 L. grass-catcher. 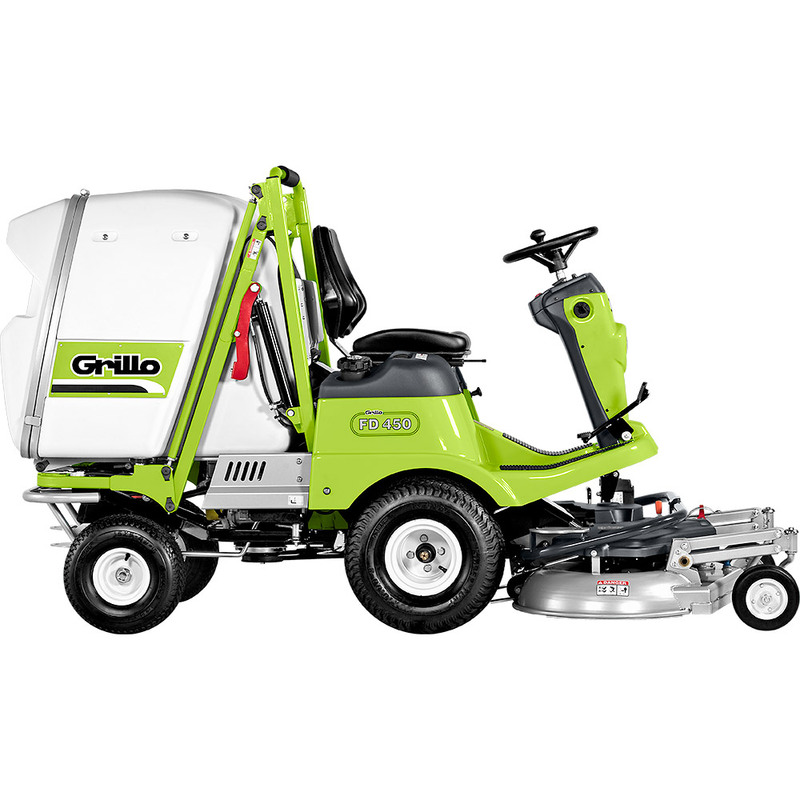 Under difficult conditions, when the grass is high and wet, the Grillo FD450 is extraordinarily efficient. 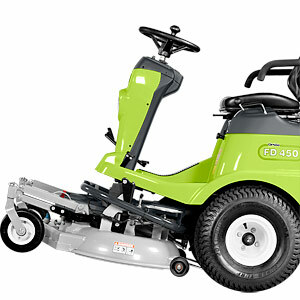 During the autumn season, when the grass is covered with leaves, the FD450 will collect them without blocking. 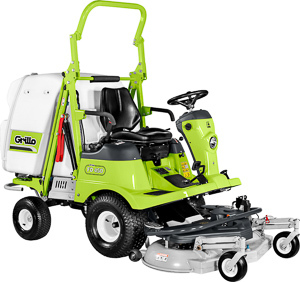 The Grillo FD450 is extremely maneuverable and easy to drive! 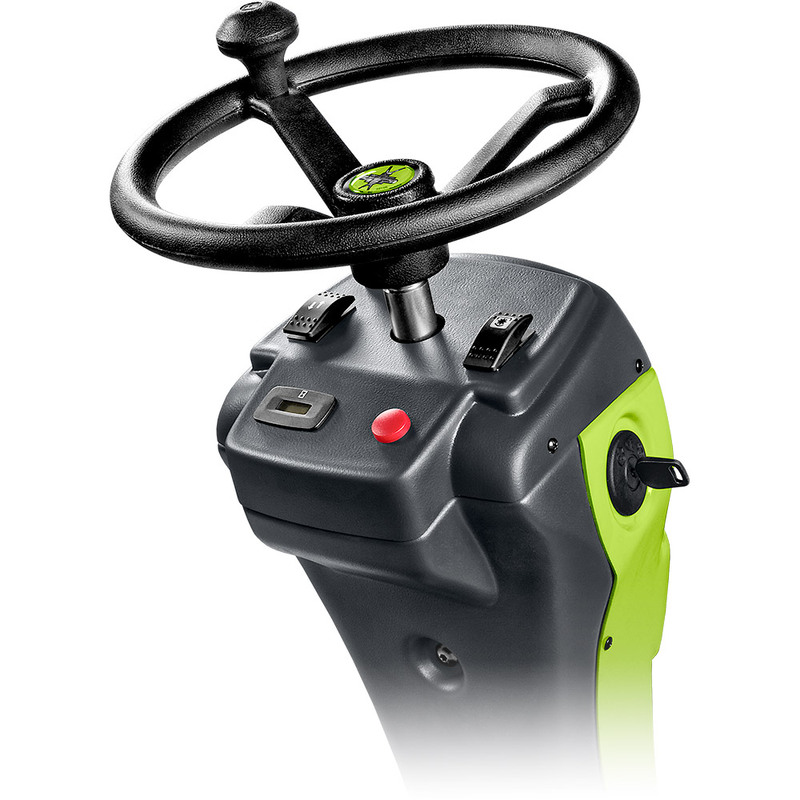 Control is via a steering wheel and the rear wheel steer produces an inner turning circle of just 30 cm. The hydrostatic transmission is controlled by a pedal, forward to go forward, back to go back! 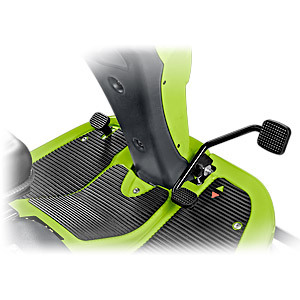 The pedal is fitted with a “damper” to enable smooth operation. 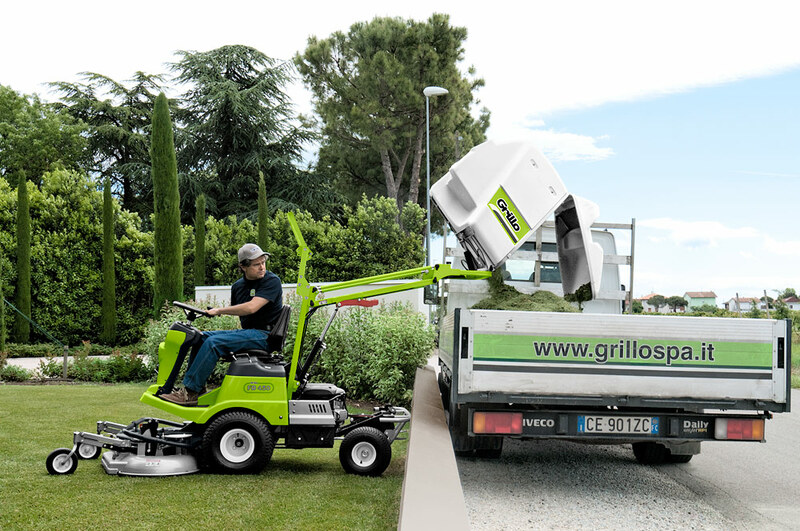 In tight areas or when maneuvering or in the presence of obstacles, the Grillo FD450 shows how agile it can be! The floating cutting deck ensures a perfect cut even on undulating ground. 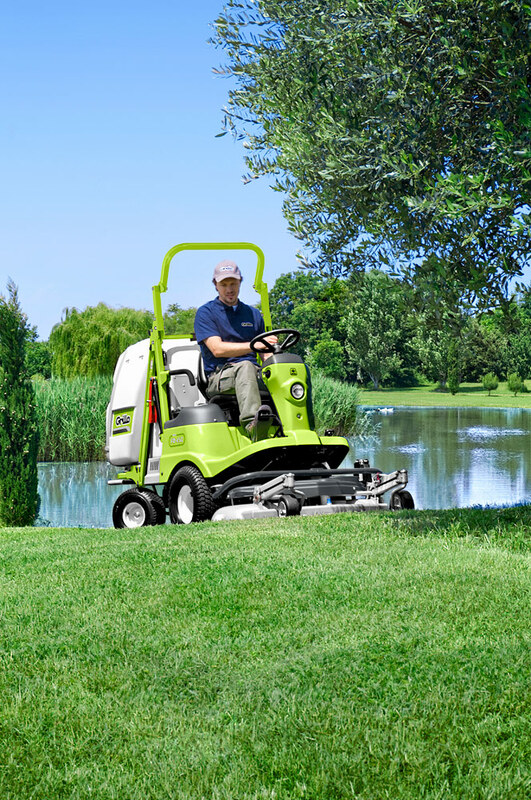 The rear pivoting axle, the tires with an anti-skid profile, allow, together with the pressure adjustment of the cutting deck on the ground, to follow with extreme precision any undulations, and therefore eliminate the possibility of scalping the grass. Forward speed ranges from 0 to 11 km/h and is continuously adjustable. 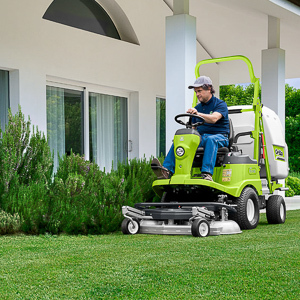 Taking care of your lawn will be a pleasure not a chore. When necessary, the differential lock, operated via a pedal with automatic disengagement, allows greater traction and safety. The cutter deck's wheels are solid and puncture-proof. The blades are automatically disengaged once the grass catcher is full. There is also the possibility to choose the “buzzer indicating” option that signals when the catcher is full. The emptying of the grass catcher is performed via electrical push-buttons, easily reached from the driver's seat; the 2 independent hydraulic rams raise the grass catcher up to a height of 170 cm with a rear overhang of 45 cm allowing easy tipping. Opening of the catcher rear door is automatic. Engagement of the cutter blades is made via an electromagnetic clutch. The control is by a push-button. 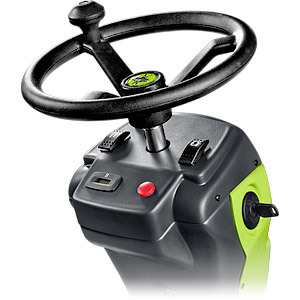 The parking brake, once engaged, allows you to dismount the machine with the engine running and the blades disengaged. In this case, the hydraulic controls for the cutter deck and grass catcher are automatically excluded. 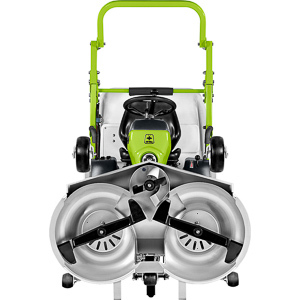 The FD450 is fitted with a petrol 18hp B&S 7220 Professional Series twin cylinder engine with electric start and 17L fuel tank with level indicator. The engine has a 656cc displacement and incorporates the latest technical innovations ensuring reliability, low emissions, reduced consumption, high performance and vibrations levels which are reduced to the minimum. The FD450's exhaust “Grillo Super Silent” is designed by Grillo in order to obtain the highest possible noise reduction levels, emissions reduced and minimal exhaust resistance. The engine is a professional series with bearings on the crank, an oil pump, oil filter and cast iron cylinder liners. The FD450’s design is up to the minute! The bodyworks modern clean lines as well as the attention to detail will immediately impress everyone! The operators position of the machine is ergonomically designed. 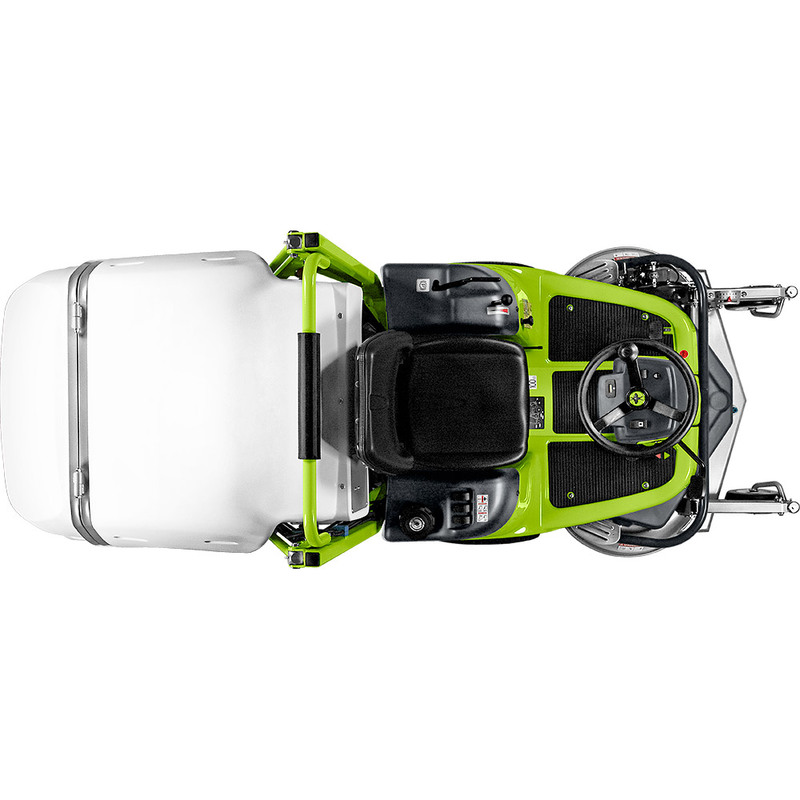 The comfortable and capacious seat is equipped with adjustable suspension to adapt to the operator's weight. Once you have finished work, cleaning the cutting deck is quick and easy! Connect a water hose to the quick coupling on the deck, let water flow and engage the blade for a few seconds...loading chute and cutter deck will be cleaned with minimal effort! 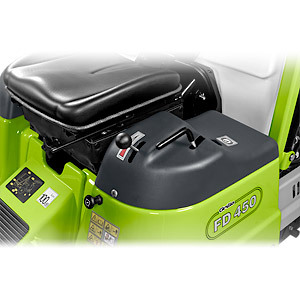 The FD450's cutter deck can be easily demounted and be stably positioned vertically on its supports which are designed for this purpose; just remove the drive belt via a quick lever for easy maintenance or inspection. There is the option to remove the grass duct without any special tools. 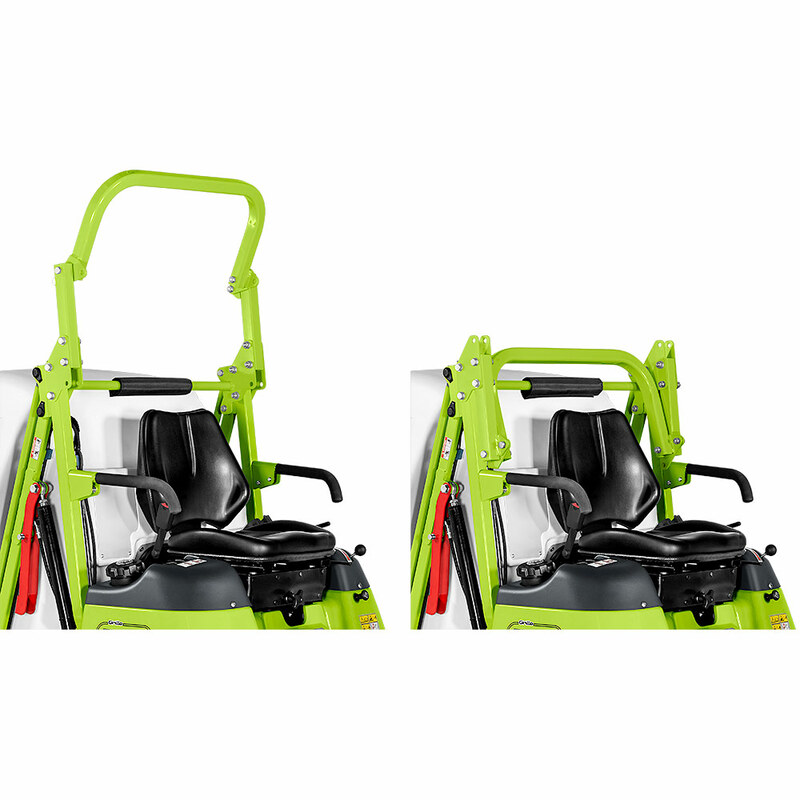 The engine and transmission components are easily accessible for inspection or servicing by lifting the grass-catcher and the seat. 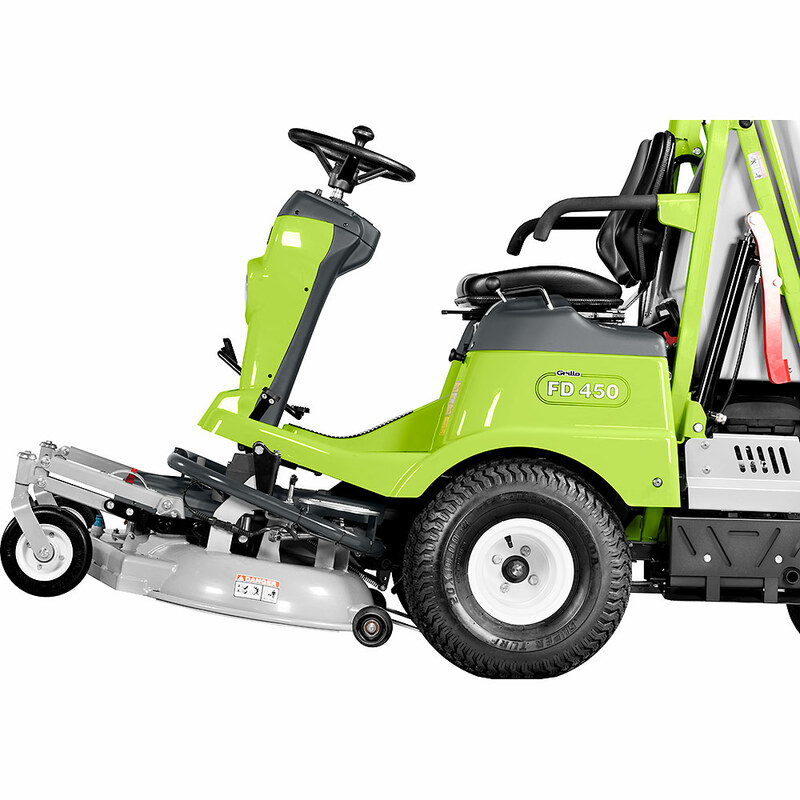 The Grillo FD450 is equipped with lifting hooks for easy transportation. All components, from the simplest to the most complex, are of high quality standards. 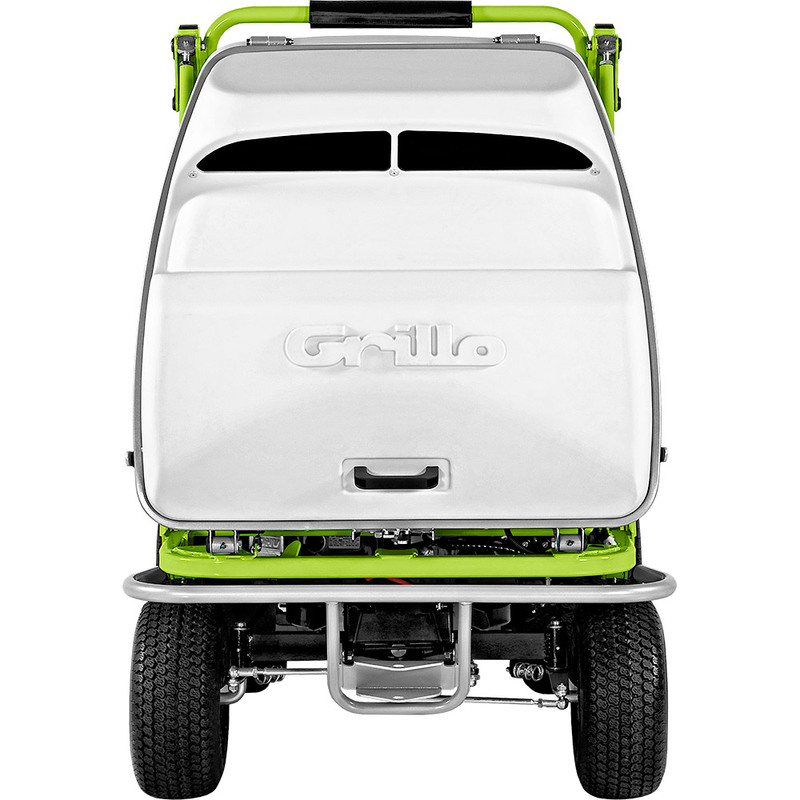 Chassis, transmission, cutter deck, are all built by Grillo in Italy using only premium materials and cutting edge technology. All this to achieve a constant 100% high level quality control. Painting of Grillo machines consists of a double electrostatic powder coated process. Grillo machines are assembled with care in every detail and tested scrupulously by specialized personnel. Final inspection means a machine whose engine has been run in order to check its performance. Grillo FD450 has been mounted with care in every detail and tested scrupulously by specialized personnel. Final inspection means a machine whose engine has been run in order to check its performance. FD450 , as with all Grillo products, is designed and built to last and retain their value over many years. Cutter deck Frontal cutting deck with collection. Mulching kit cod. 9M0611 is an optional attachment. Solid wheels. Cutting deck with coupling for washing. Grass collector capacity 450 litres with full grass catcher motorised micro-switch. Grass collector discharging system Grass-catcher discharge and lifting hydraulically operated. Movements are activated through electric buttons. The grass-catcher opening is automatically activated.